Make together or separate, these pancakes are the perfect weekend breakfast. 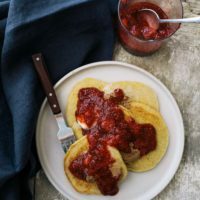 Best of all, the strawberry jam is lightly sweetened- a toddler-breakfast plus! In a small sauce pan, combine the strawberries with the lemon juice, maple syrup, and lavender. Heat over medium-low heat until the strawberries are soft enough to mash, 10 to 15 minutes. Mash with the back of a fork or spoon then stir in the chia. For thicker jam, use 3 tablespoons. Reduce the heat to low and cook for another minute or so. Remove from heat, transfer to a jar, and let sit to cool. As the jam cools, the mixture will thicken. Once the jam is cooling, make the pancakes. In a small butter warmer or sauce pan, heat butter and maple syrup together until butter has melted. Remove from heat an let cool. Combine dry ingredients in a bowl. Crack in the eggs, measure in the milk, and add the cooled butter/maple syrup mixture. Stir until just combined. Set aside while heating the skillet. Heat a skillet over medium heat. When skillet is hot (if you flick water onto the skillet, it should sizzle), add roughly 1/2 tablespoon of butter. Take about ¼ cup of batter and pour onto skillet. Let cook for 1-2 minutes (until the pancakes begins to bubble slightly. Flip and let cook for another 1-2 minutes until pancake is cooked through. Repeat with remaining batter and serve with a drizzle or spread of your favorite nut butter and a drizzle of the strawberry jam. Tips + Tricks: Make the chia jam up to three days ahead of time.